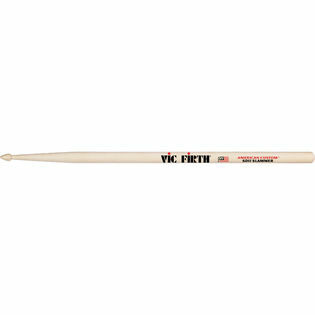 Vic Firth SD11 Slammer Wood Tip Drumsticks feature an arrowhead tip that cuts with minimum effort. The SD11 are turned from select rock maple for a light, fast-playing stick with great flex and rebound. Length: 16 1/4" Diameter: .610"
Vic Firth SD11 Slammer Wood Tip Drumsticks feature an arrowhead tip that cuts with minimum effort. The SD11 are turned from select rock maple for a light, fast-playing stick with great flex and rebound.